I just love summer, don't you? A cold glass of lemonade on the front porch sure does take me back to "the good 'ole days" when my biggest concern was, "Is momma going to buy me ice cream after swim lessons?". Now that summer is knocking on the door, I've been stocking up on summer goodness like lemonade for hot summer days. You know me, I wanted to incorporate what I love into a cupcake form. This isn't an original idea, but I tried to make it my own. Others have made it with frozen lemonade, lemon cake mix, and lemon zest. I chose to make mine with Kool-Aid powder! My husband insists these are the best cupcakes I've ever made...I am particularly biased to chocolate, so my Andes Mint Cupcakes are my fave! In a large mixing bowl combine white cake mix with egg whites, oil, and water and mix with an electric beater. Add in one package of Kool-Aid Pink Lemonade Mix and mix until well combined. Beat butter for a few minutes with a mixer on medium speed. Sift in two cups of confectioners sugar on low speed until well combined. Add in salt, vanilla, lemon, Kool-Aid, and milk and mix on medium speed for 2 minutes. If your frosting is thin, add more confectioners sugar. If your frosting is too think, add in more milk. Pinned it! Can't resist a good cupcake recipe! These are too pretty to eat! They're getting pinned right about now!!! Love the look of these! What size tip did you use to frost them? you do beautiful work...these look so yummy!! Excited to find you on the Texas Bloggers new blog! Whoo Hoo! Yum! I love all things in cupcake form.. but I think you make the best ones! Yum yum yum! These are so beautiful - and they sound delicious! We'd love for you to link this, and anything else you want to show off, to our Beautify It Monday link party going on now! Oh wow these look delicious! I'm a sucker for anything pink lemonade. I'm definitely pinning this and I shared this on my Facebook page! Yum! 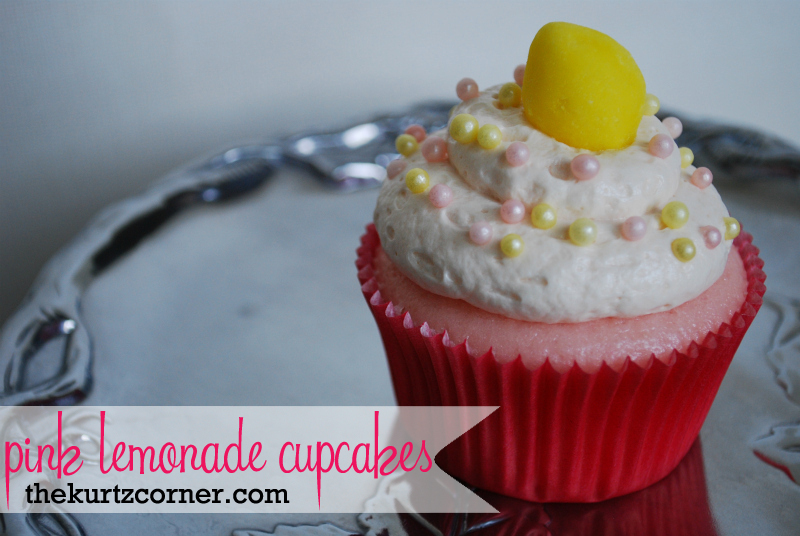 Pink lemonade cupcakes!! I think it's summer time!!! Thanks for sharing! Found you on Tip Junkie! Yum! And they are sooo pretty, too. I just did a Pinterest Favorites round up of cupcakes, and one of them was Raspberry Lemonade ones. Thanks for sharing at Handmade Tuesdays. This looks delicious! I look forward to seeing you at My Dream Canvas. These look SOOOOOOOOO good!I am a lover of any type of lemonade! I would be thrilled to have you share these at my link party going on! Mmmm... sounds delicious and looks oh so yum! Audra, Audra, Audra! These are SO gorgeous! I bet they are wonderful and I can't wait to give them a try. Just pinned these :) Thanks so much for sharing at Mom On Timeout! These sound yummy! I've pinned them, so I can make them the next time we need a sweet treat. My daughter will go crazy for it. Pink Lemonade is her favorite drink! Thank you for sharing on A Crafty Soiree. I'll be featuring this project in the newest one. I can't wait to try these this summer! Yum! 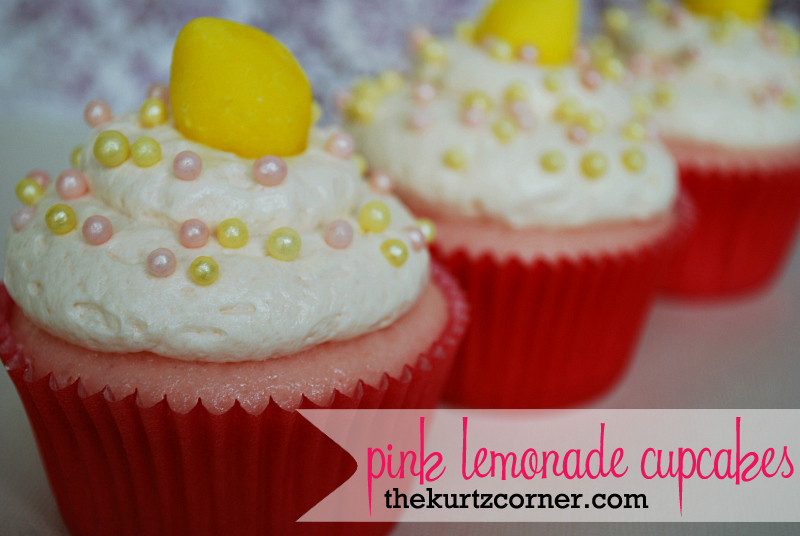 Hi Audra, thanks so much for sharing your Pink Lemonade Cupcakes at Project Queen's Link Party last week. They are adorable! I will be featuring them tomorrow night at the Highlight Party. just found your blog and loving it! these pretty little cupcakes are going on my to-do list! They are my hubby's favorites, I hope you enjoy too! I made these with the BC gluten free yellow cake mix. They turned out pretty good. My kids enjoyed them. They weren't a pretty pink because of the yellow mix but they tasted good. How Does Your Garden Grow - Giveaway! Sponsor Giveaway - $50 Amazon.com Gift Card!